As winter approaches, you may experience a higher cost of living, whether this is due to the coming holidays, higher heating and electric bills, and running your washer more often due to bulkier clothes, just to name a few. 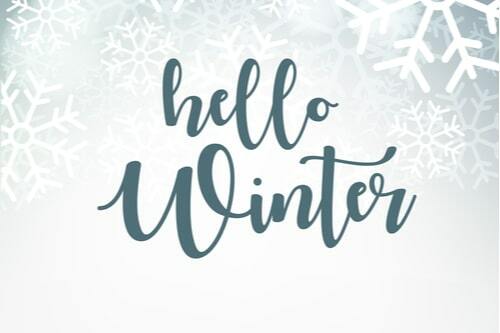 Alleviate the stresses of the coming cold months with these tips and tricks to a less expensive and more enjoyable winter season! Open the blinds to allow the natural sunlight to peek through and heat up your home. 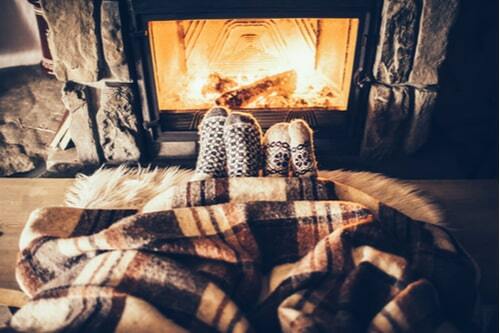 Get into the holiday spirit and use your fireplace instead of your heater at the start of the colder season. And bundle up! This is the most cost-efficient way to stay warm in the winter, and it's totally free. Weatherizing your windows also helps keep the cold out by sealing up the parts of your windows that cause a draft in your home. Reversing your fan to a counter clockwise spin will allow the warm air to circulate in the room, which can keep your home warm without raising the temperature. Before turning on your heat for the first time, check to make sure it is working properly; a blocked in take or exhaust can cause unforeseen issues. And when using your heater, keep the thermostat set at 72 degrees on the coldest days, and 66 degrees during the night to save on electricity. Lastly, when it comes to holiday lighting costs, a big way to save without spiking your electric bill is to use battery-operated lights when decorating your home. Use battery-operated items when appropriate. Small adjustments can go a long way! Living more mindfully and intentionally can help you stack the benefits of your efforts to help you realize your financial goals that much faster. Purchasing a small in-home coffee pot is a great way to get your Pumpkin Spice Latte fix for less - you may be surprised with your savings by eliminating your daily visits to the coffee shop. Dine out less, and have home-cooked meals more. By eating at home, you will cut a major cost in most people’s day-to-day lives: going out to dinner. 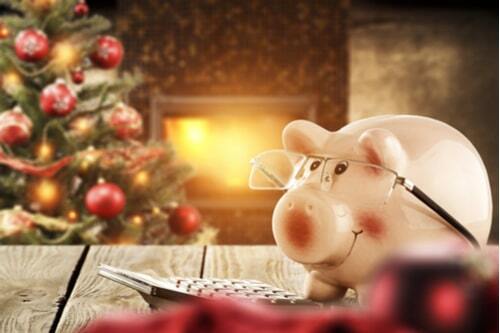 Finally, set up a savings account for the holidays, and start saving as soon as possible. Create a goal budget and take a small amount from your paycheck each week to reach that savings amount. By using the tips above, you should reach your goal in no time! Before grocery shopping, make yourself a list of what you need to limit overbuying and overspending. Keep gift bags and ribbons. There are many birthdays and holidays that we receive ribbons, tissue paper, and gift bags. Keep them tucked away to be used again, especially for the winter holiday season. Make your decorations for Christmas.There are hundreds of “Do It Yourself” tutorials on the internet that teach you how to cost efficiently make your own wreaths, ornaments, and window decorations. When it comes to holiday shopping, there's one big s-word that reigns supreme: Sales, Sales, Sales! When holiday shopping, plan out your store visits by finding out when your favorite shops are having sales. If you find that you are struggling with money to do your holiday shopping, you can apply for installment loans. Another unexacting way to save money is to keep cash in your wallet! It gives you a built-in budget cap that you can't exceed. Limit the amount of times you use your credit card. By using only cash, you will have a visual picture of exactly how much you are spending. When you can't avoid using plastic, use it wisely. Some credit cards have reward points associated with spending. Check to see if your credit cards have rewards points, and if they do, use them for shopping to maximize your savings.